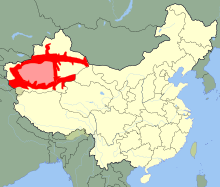 Uyghur (ئۇيغۇرچە, Uyghurche), formerly known as Eastern Turkish, is a Turkic language with 8 to 11 million speakers, spoken primarily by the Uyghur people in the Xinjiang Uyghur Autonomous Region of Western China. There are several writing systems used to write Uyghur. While Uyghurs usually use the Uyghur alphabet, an alphabet based on the Arabic alphabet, there are also two Latin and one Cyrillic alphabet that can be used to write Uyghur. ↑ In English, the name of the ethnicity and its language is spelled variously as Uyghur, Uighur, Uygur and Uigur, with the preferred spelling being Uyghur. Many English speakers pronounce it as /ˈwiː.ɡər/, though the native pronunciation is [ʔʊjˈʁʊr]. See Mair, Victor (13 July 2009). "A Little Primer of Xinjiang Proper Nouns". Language Log. Retrieved 16 July 2009. Уйгурский (язык) (transliteration: Uygurskiy (yazyk)) in Russian. This page was last changed on 3 December 2017, at 12:15.